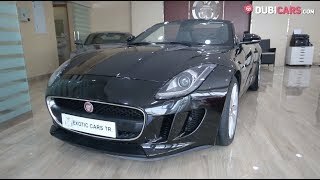 Pre owned Jaguar F-Type for sale in Sharjah by Exotic Cars Tr.. 6 cylinder engine, black exterior and automatic transmission. Comes with 19″ wheels and black interior. 91,000 kilometers on the odometer, GCC specs. Be sure to check out our video of this Jaguar F-Type above! See all used Jaguar F-Type for sale in Sharjah.